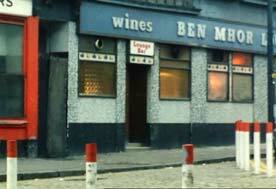 The Ben Mhor Bar sat at the corner of Henderson Street and Maryhill Road formerly New City Road. There has been a public house on this site since the tenement building was erected in 1876. Timothy Warren was the first licence holder. Mr Timothy Warren was a well known and respected Glasgow publican in the trade. He had a good reputation and his pubs had some of the best managers in the city. Good clean premises and good quality wines, spirits and beers were always served especially Warren's own proprietary blend of "Heathery Knowe Old Highland Whisky". By the 1890s Mr Warren had premises all over the city including 51 Clyde Street in Anderston which he acquired in 1888, 90-92 Kelvin Street (1887), 15-17 Dunchattan Street (1879), 41 Scotia Street corner of 89 Grove Street (1889), 482 New Keppochhill Road (Pinkston Bar), (1889). His son also Timothy ran pubs at 254 Garngadhill at the corner of 53 Rosemount Place (1891), many will still remember this old pub as the "Benburb Bar", and 30 Maitland Street at the corner of 40 Milton Street, (1891). This view was taken from Napiershall Street. 1970s. 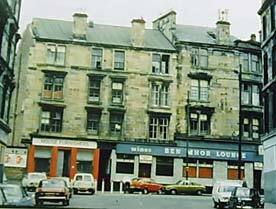 Mr Warren had the advantage of owning various pubs including Henderson Street, New Keppochhill Road, Scotia Street and Clyde Street, Anderston. In 1902 he was living at 30 Kersland Street. Mr Warren's son Timothy jun traded under the title of Timothy Warren jun & Co, wholesale wine & spirit merchants having his offices at 39 Scotia Street. Timothy jun was then living at 194 Renfrew Street before moving to Guilsland in Beith. Other members of the family took control of the other pubs when Mr Warren passed away around 1904. Charles Law Warren was licensee of Henderson Street which he took over in 1907and New Keppochhill Road premises, Thomas Thorburn Warren had 41 Scotia Street and Dunchattan Street, Caroline Warren had 30 Maitland Street, and Timothy jun had 51 Clyde Street in Anderston and 90-92 Kelvin Street. This image was taken in 1969. 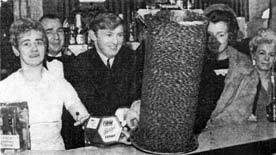 Partick Thistle footballer Johnnie Flanagan knocking down a pile of pennies in the Ben Mhor. Watching are Mr and Mrs Duffy, manager and manageress, Mrs J Darge, Royal National Institute for the blind, Glasgow and West of Scotland, to whom the proceeds went, and Mrs J Rogers, assistant manageress. Various pubs were sold off and after the First World War the War there were only three pubs left, Charles Warren had the Henderson Street and New Keppochhill Road Premises, while Thomas Thorburn was running the Scotia Street premises. During the 1930s Ann Warren was licensee, she continued as licence holder until the 1950s. The pub was conducted by the trustees of the late Charles Warren, Ann or Annie as she was better known was the widow of Charles, his son Norman and Mr J B Anderson, all of whom took a close personal interest in the business. The firm pinned their faith to "Castle" ales, and a notable feature at Warren's was the care taken to ensure that all draught beer was supplied from cask to customer in perfect condition. A modern system of piping was used and the very latest pattern of silver counter founts had been installed. The pub was commodious and comfortable and an excellent electrical tubular heating system was fitted throughout the premises now known as radiators. Good cellar management was also an important part of the business, there was stillion accommodation for casks and plenty of room for bottling operations. Evidence that the firm ranked high, as employers, was the fact that Mr Allan Maclean, shop manager, who was a native of Tiree, had been with the firm for well over forty years. Mr Maclean was not only highly esteemed by his employers but also by a large circle of personal friends and customers. In 1960s many will still remember Alexander D Campbell as licensee and in 1972 John Murdo MacMillan took over the pub. During the 1970s the pub was filmed in part of the Jimmy Boyle story the Sense of Freedom.